Now that fall has arrived, many of my hens are either molting or have just finished the process. Some of my molting hens lose feathers very gradually and the only obvious sign that they are in a molt are lots of fallen feathers littering the run and yard. Others lose many feathers all at once. Some of my heavier molters actually seem to be embarrassed by their lack of feathers. The molting hens are temporarily more stand-offish, which I think naturally protects them from being feather-pecked by the other chickens as their new feathers come in. This embarrassing loss of feathers and temporary ugly duckling stage will eventually lead to a beautiful new set of chicken duds. 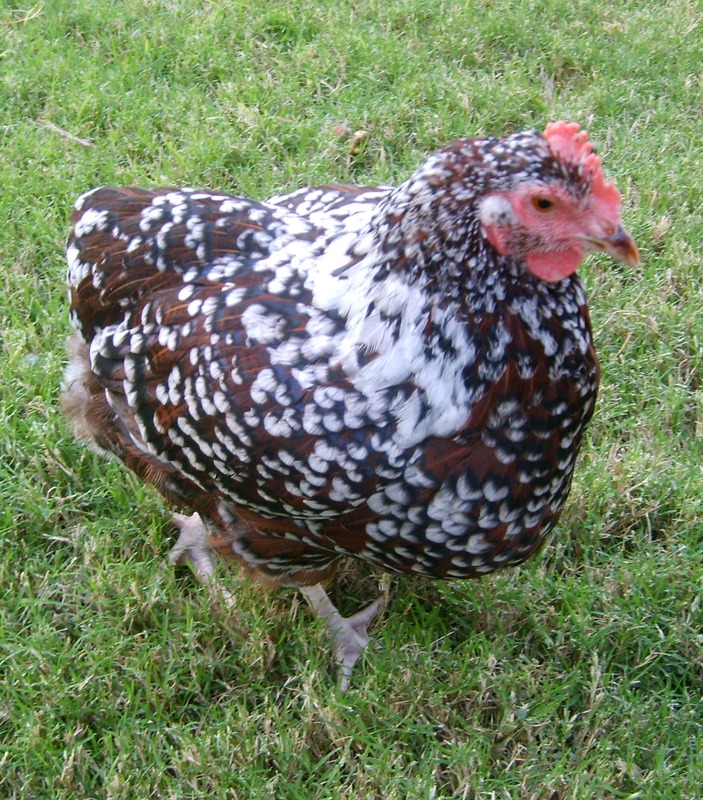 Most hens will regrow a new set of feathers identical to their original coloring, while some will became even prettier, as seen in the following before and after photos of an Easter Egger and a Speckled Sussex. The temporary loss of feathers is a small price to pay for such a beautiful new set to show off and preen during the rest of the year. Perdy, my dalmation Easter Egger, was about 4-5 months old here and quite pretty. Perdy, after her first molt — quite striking and unusual in her coloring. Perdy, again after her 2nd full molt – even prettier than before. 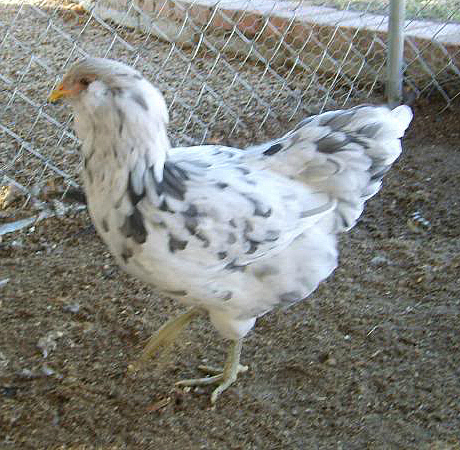 Notice the change of color on her tail feathers – from grey to white after molting again. Typically, molting hens will lose and regrow feathers in their neck first, followed by a loss and regrowth of feathers in the breast, body, wings, and finally the tail. Most chickens will molt sometime after reaching 1 year of age, but a small number will molt early — only a few months after laying begins. Molting season starts in late summer, with the majority of chickens molting in the fall, but there are always exceptions. Unfortunately, a few poor chickens will even end up partially naked during the winter. This is Freckles, during her first molt. Look closely to see the newly started pin feathers in her neck area – the feathers on the rest of her body are becoming loose and falling out. 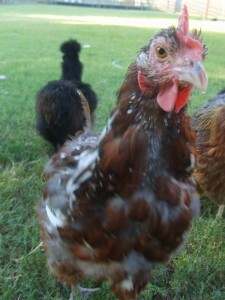 Poor Freckles has only 1 tail feather left in this photo. Since her neck molted first, the back of her neck is already turning white. Freckles may have taken this new look too far! It seems as if she’s attempting to imitate an Araucana (a tail-less and rumpless breed). 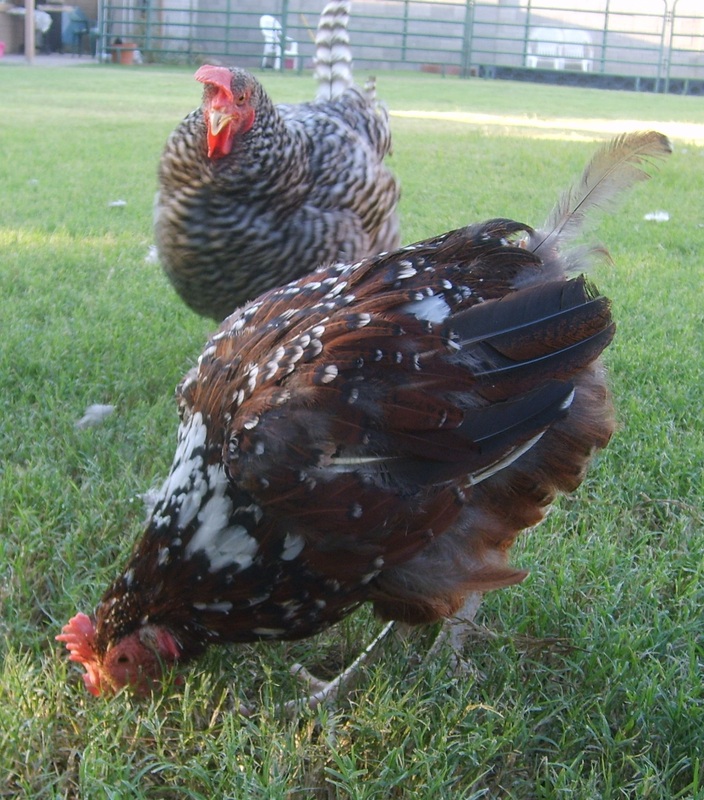 Freckles and her buddy, Pepper, this past summer – before molting season. Regrowing an entirely new set of feathers can be tough on a hen and the hen will usually stop laying sometime during her molt. 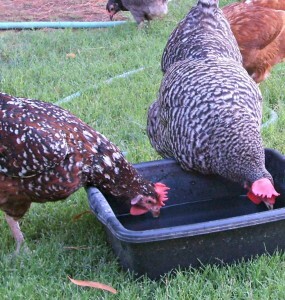 Chickens need protein to grow new feathers, so I like to give my molting hens a nutritious boost with high protein chicken treats, such as mealworms and scrambled or boiled eggs. My molting hens also receive Sea Kelp as an added nutritional bonus. Some of my heavy duty arsenal for molting season. So far, I haven’t had much of an issue with non-molting hens picking at new feathers of molting hens, although my Speckled Sussex is still tail-less. If she doesn’t grow her tail feathers soon, she may need some intervention after all. If so, I’ll have to reach into my cupboard for for help. 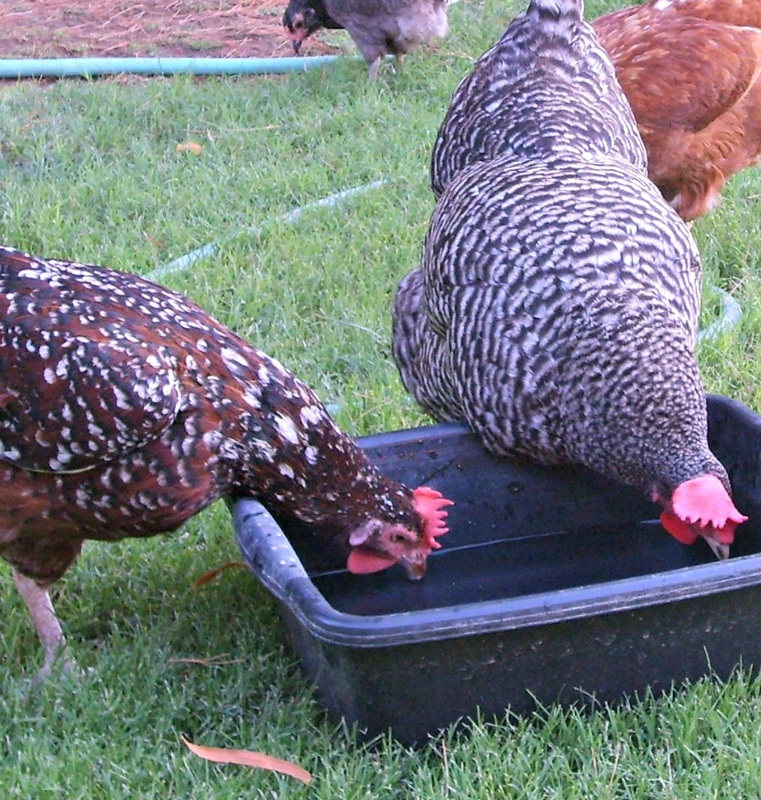 My favorite two products to use for preventing feather-picking are the Pick-No-More lotion, which can be applied directly to the chicken’s bare skin and has healing properties, and the Hot Pick Spray, which is better for covering a larger area and can also be sprayed directly onto the feathers. Both contain only natural ingredients, but because of their terrible taste, prevent other chickens from trying to eat growing feathers coated with either of these products. Do you do anything to help your molting hens during their molt or do you just let nature take its course? Have any of your chickens sported a brand new look after their molt? Wow, Perdy is absolutely gorgeous! I’ve never seen a dalmatian easter egger before but now I want one! 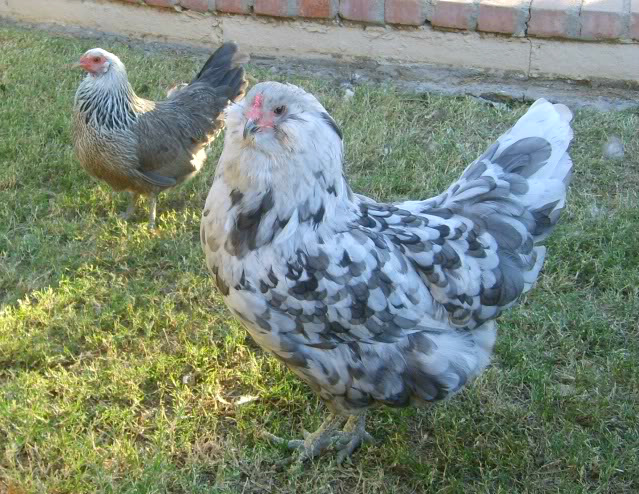 🙂 I used to have 2 Splash hens, so we named them Pongo and Perdy (101 Dalmations) and Perdy was definitely the prettiest.. 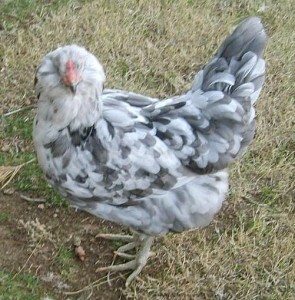 In the picture of Perdy you have a litte bantam, what kind is this? I have a question. I’ve read that it’s best not to supplement light in the winter months so chickens can concentrate on molting and not egg production. I have heard that if you don’t supplement light and they do molt that egg production will be decreased when they do start laying again. I want to get my chickens through the winter but worried that when they do start laying again their egg production will be significantly decreased. Is it better to supplement light or not? My chickens are 6 mos. old and only 2 of them are laying so far. Thanks for the help! Those are great questions. I, personally, do not add light to the coop so that my hens have a period of rest. Each hen has a predetermined number of eggs they will lay in their lifetime and if they are forced to lay all year round, they may stop (or greatly reduce) laying at an earlier age. My two 4 year old hens still lay regularly. 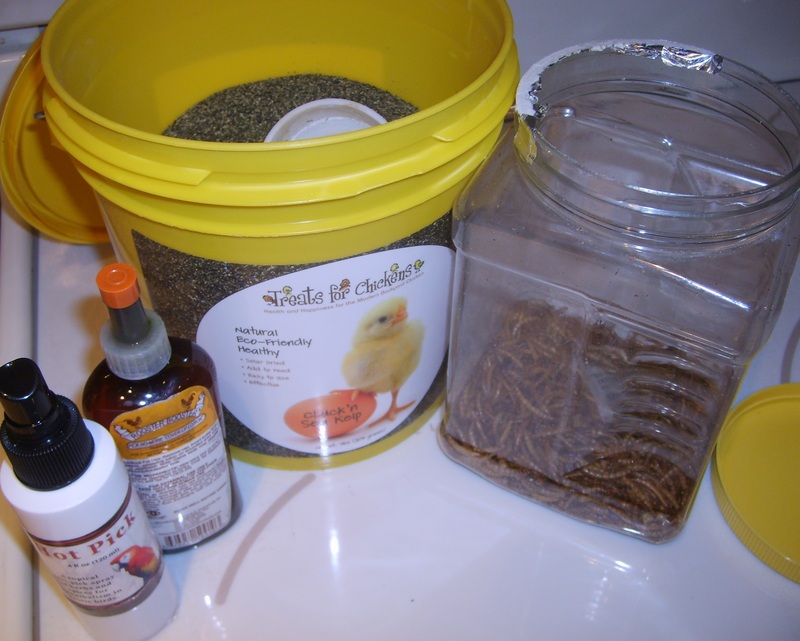 For those who do want to add light to the coop, and it is a good idea in some situations, it’s best not to add extra light until all your hens have finished molting. Here is some information on how and when to add light to the chicken coop: http://www.mypetchicken.com/backyard-chickens/chicken-help/If-I-want-to-add-light-to-my-chicken-coop-during-H159.aspx?